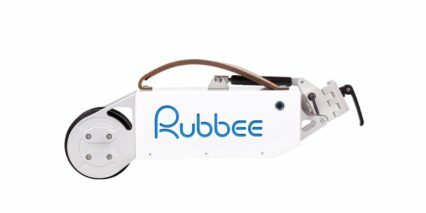 Rubbee is a company based in Lithuania that manufactures easy to install electric conversion kits for bicycles. The product is unique in the way it utilizes the all-in-one concept. The batteries, electronics and the motor are all integrated inside the unit and a friction roller transfers the power directly to the rear wheel. The first batch of units (the 1.0 version) was financed by a Kickstarter campaign in the summer of 2013. Following version, the 2.0 released in early 2015, had upgraded mechanical assembly. In the end of 2015 the version 3.0 was introduced with overhauled electronics and a smartphone connectivity. The 3.0 version introduced different power modes, GPS corrected speed tracking and a precise battery level measurement.